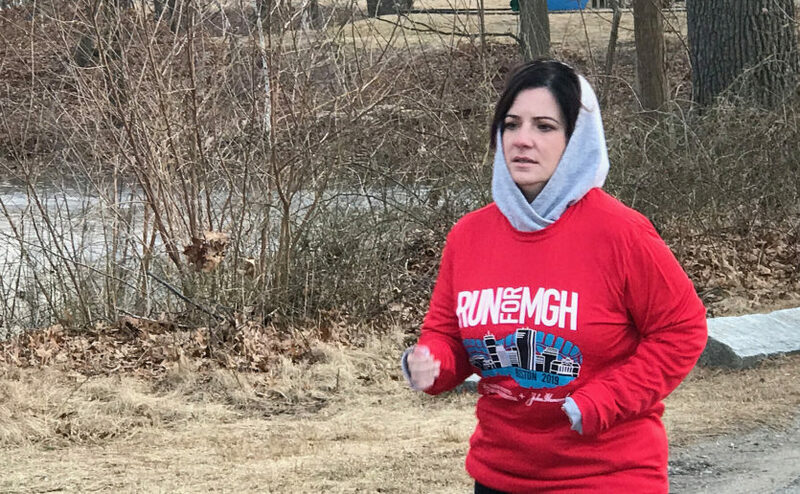 Stephanie Rosa will run the 2019 Boston Marathon® in gratitude for the care Mass General has provided for her daughter, Olivia Silva. For just about most of her life, 10-year-old Olivia Silva has dealt with the pain and uncertainty of a brain tumor. Despite lengthy chemotherapy treatments and other complications, Olivia has remained cheerful and optimistic, inspiring those around her. Olivia has long enjoyed coming to Massachusetts General Hospital for examinations and treatment, Stephanie says, because of the kindness of doctors, nurses and clinical staff. For that reason, Stephanie will run the 2019 Boston Marathon® as a member of Mass General’s Pediatric Cancer marathon team, raising money for cancer care and research initiatives that enhance the quality of life of young patients like Olivia. Olivia – a resident of Lynn, Massachusetts – was just two years old in 2010 when an MRI at Mass General revealed she had a brain tumor. It was a bittersweet time for Stephanie. The diagnosis came on the day she was expected to give birth to her second child. Stephanie knew Olivia was sick but hadn’t braced for such news. The next day, Stephanie delivered a daughter. On the following day, Olivia underwent surgery for nearly 10 hours as doctors removed half of the tumor. “The remainder was close to the brain stem and too dangerous to touch,” Stephanie says. Despite the pain and uncertainty of a brain tumor, Olivia Silva has remained cheerful and optimistic, inspiring those around her. After surgery, fluid built up in the ventricles of Olivia’s brain, prompting her doctors to install shunts to better regulate the flow of fluid. She’ll need shunts for the rest of her life, and they often need to be replaced. In 2015, Olivia had six surgeries over a five-month span because of complications with each new set of shunts. Olivia has also had two extensive rounds of chemotherapy. The first started after her surgery in 2010 and ended a year later after she became allergic to the treatment. Other than the shunt-related complications, Olivia was in relatively good health for several years following chemotherapy. But in 2017, Stephanie started to worry when Olivia became ill with the same symptoms that had led to the initial diagnosis years earlier. Her annual examination showed the tumor had grown again, requiring another year of chemotherapy. Yet, persistent headaches and vomiting couldn’t keep Olivia from smiling. To those who don’t know Olivia, her mom says, they never detect she is sick. With Olivia’s tumor now stabilized, she was able to stop chemotherapy in December. She’ll be monitored at Mass General with regular checkups and MRI exams. She often has to adjust to the side effects of the tumor. Headaches sometimes force her to either miss school or come home early. She seeks comfort in the school nurse’s office if gym class gets too loud. Olivia says she likes going to Mass General because the staff always give her things to color, one of her favorite activities. Stephanie, 35, jokes that she’s not a runner. Her only lengthy official run was a half-marathon last year. Still, she’s determined to run the Boston Marathon® as a way to thank and help Mass General’s Pediatric Hematology Oncology department.